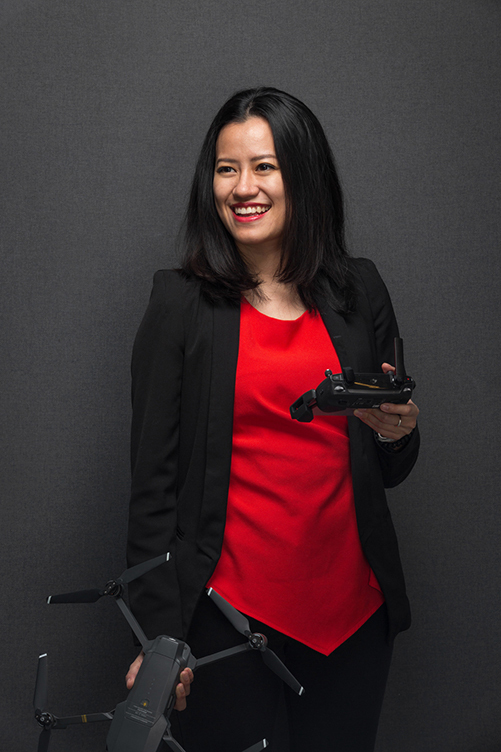 Pae Natwilai (MSc Mechanical Engineering 2015) is founder and CEO of TRIK, which produces software for creating interactive 3D maps of large structures from Drone footage. 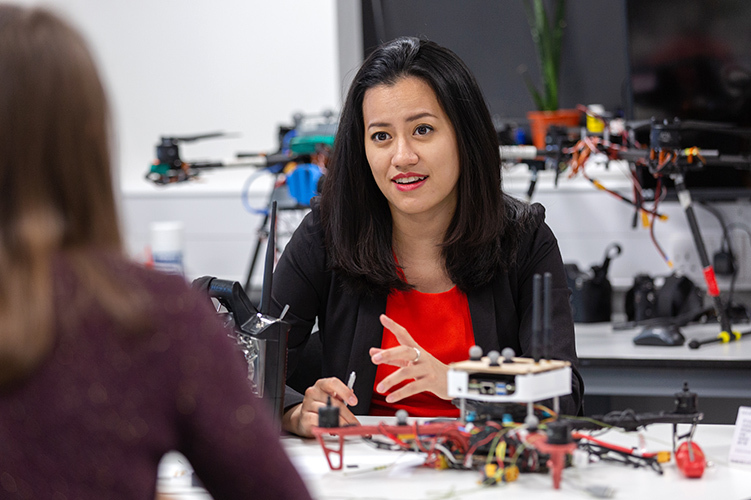 Pae originally developed TRIK as a project for WE innovate, Imperial’s programme to encourage entrepreneurial women. In 2017, she won the design innovation award, and was named as one of Forbes’ 30 under 30. Pae was originally just coming in for the Cover shot above (which I shot in the student union studio, using a sound deadening panel for the backdrop). We wanted to grab a candid image too, and Pae was kind enough to allow me to take her across campus to find a space. The Enterprise Lab who first helped Pae start her business was unfortunately too busy with a Ministerial visit, so we headed to the Aerial Robotics Laboratory where one of the students was happy to help us. As Pae was saying goodbye from the Aerial robotics lab, she mentioned that she was going to be meeting her Mentor in the afternoon, and that her mentor had changed her life. They kindly changed the location of their meeting and came back to campus to have it in the Enterprise Lab (which was now available) giving us some more lovely candid shots in the space, with a nice back story. One of Pae’s images is now on the homepage of the Enterprise website. The College photography toolkit has a range of resources to help source or commission photography in the College. 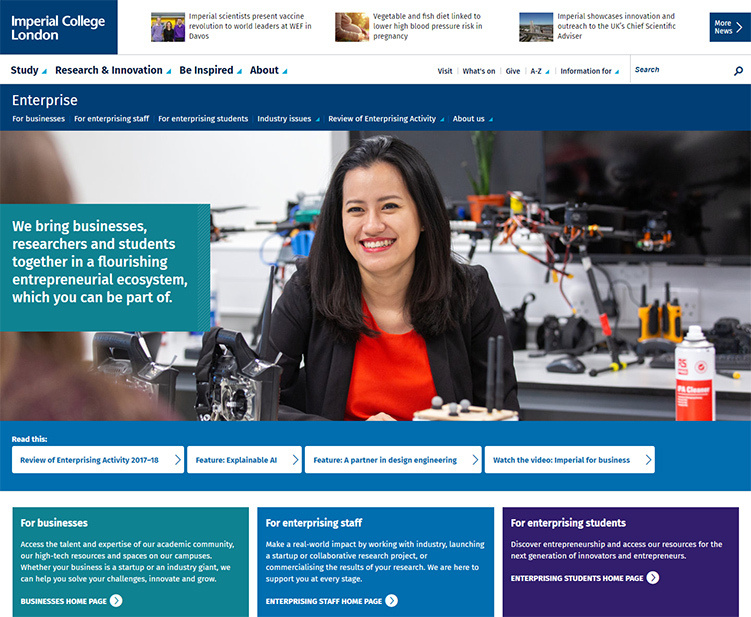 Visit the new Imperial College London Photography Toolkit here.